Yes, St. Patrick’s Day was a few weeks ago, but we wanted to share this delectable recipe today for another reason—this upcoming weekend (April 14-15) Kelli and I will be at the Gluten & Allergen Free Expo in Chicago where we’re co-teaching (along with Beth Hillson) the Bread & Beyond class on Sunday. Making delicious gluten-free breads at home isn’t nearly as difficult as some people think. In the class we’ll teach bagels, baguettes, and focaccia. 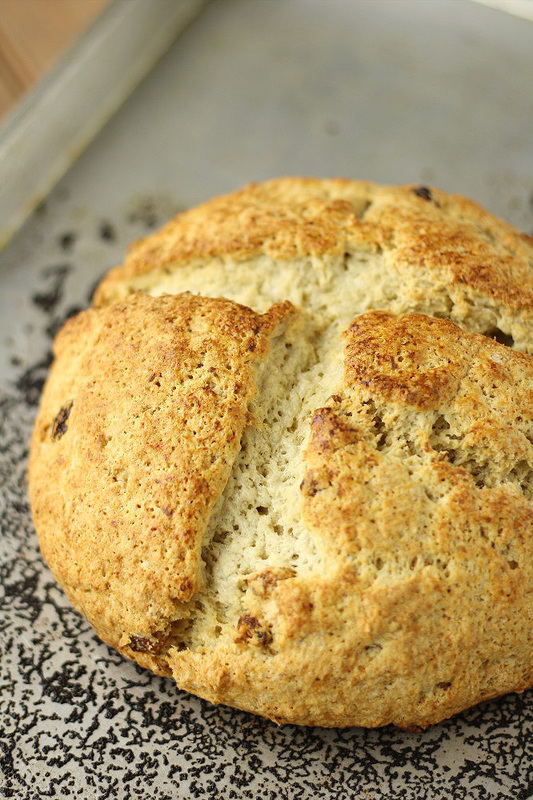 Today’s recipe for Irish soda bread is a great example, too. It’s flakey, moist, very tender, and subtly sweet. It’s sort of like a huge scone, except that it’s Irish soda bread. The next time you’re looking to make a yeast-free quick bread (where the buttermilk and baking soda/powder react to form carbon dioxide), put this recipe near the top of your list! 2. Combine the flour, sugar, baking soda, baking powder, and salt. 3. Cut the butter into the flour mixture to make pea-size crumbs, then add the golden raisins and toss to combine. 4. Mix together the buttermilk and eggs, then add to the flour-butter mixture. Use your hands to mix together to form a wet dough. 5. Place a little melted butter on your hands (to prevent the dough from sticking), form the dough into a large ball, and place on a greased cookie sheet. 6. In a separate bowl, mix together 1 tbsp melted butter and 1 tbsp room temperature buttermilk. Brush the mixture onto the loaf, then cut an “X” into the top of the bread loaf. 7. Bake for 55 to 60 minutes, until golden brown. This recipe is: gluten-free, peanut-free, tree-nut-free, fish-free, shellfish-free, soy-free, yeast-free, vegetarian. Per 1/16 wedge of bread loaf: 166 calories, 7g fat, 25g carbs, 4g protein, 300mg sodium, 4g sugars, 3g dietary fiber, plus at least 40% RDA manganese, at least 20% RDA selenium, and at least 10% RDA phosphorous. Lovely! I just so happen to have golden raisins in my pantry! Currents were the fruit hanging around my pantry. The’re nice too! The taste of the bread is lovely. It is also very, very crumbly. I know your flour mix has xanthan gum in it for a baseline level, but should the recipe have had a bit of xanthan gum also? I’ve used your flour mix before and it hasn’t turned out quite so crumbly. 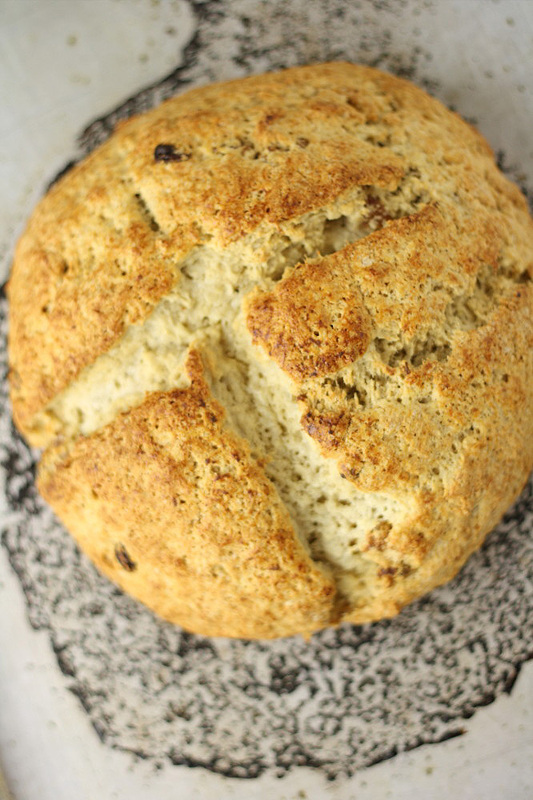 I had a GF Irish Soda bread recipe accident a few years ago that turned out wonderful. I’m going to have to dig out that post and make it again. You’ve got me in the mood, now. Hi Sharon… The soda bread shouldn’t be overly crumbly. You could certainly try adding a touch of supplemental xanthan gum, which we often do in recipes (but did not in this instance).